The year was nine-hundred-and-ninety-nine Anno Domini of the Julian calendar. It was a cold winter night in Saxony on the eve of a new millennium. A young man named Michael, a noble and a knight's squire, the vassal of Margrave Heinrich of Eilenberg, kneeled in the cold, drafty chapel in the emperor's palace at Aix-la-Chapelle and shivered. The house of worship was crowded with men of war and of the cloth, all hoping for the Lord's blessing. Shoulders on either side brushed Michael as they prayed. A terrible foe from the north, Normans, had invaded the Holy Roman Empire from the sea. On this eve of a new millennium, a great battle was to be fought. Some said that it signaled the Armageddon, the final conflict between good and evil, Gog and Magog warring against Holy Christians, Satin's minions descending upon the Holy Roman Empire in a struggle to the death. "Armageddon." The archbishop, His Majesty Otto's own confessor, had used the word in his sermon at high mass. The word conjured up phantasmagorian images in Michael's mind of hordes of monstrous demons screaming horrible curses as they attacked while he fended them off with a broadsword. Another thought crossed Michael's mind as he knelt on the frost-damp stone floor; that this was the end of the world. After the final battle, Lord Jesus, his Savior would descend from heaven to judge the quick and the dead. And what if he, Michael, had committed a mortal sin for which he would he be thrown into the fiery pit of Hell to burn for all time? He reviewed his life, all eighteen years of it, and realized he had committed many sins. Just last week, there had been that servant girl ... He prayed hard for comfort, guidance and forgiveness as his eyes rose to the huge crucifix behind the altar. The blood that streamed from His crown of thorns, His wounded palms, His crossed feet, the gore oozing from His side, all seemed real, as though He was present in the flesh as well as spirit as He frowned down upon Michael, sinner and coward. Yes, coward. Michael had been told over and over by his betters that in the coming battle he must be ready to sacrifice his life, his most precious life, for Margrave Heinrich, for Emperor Otto, for the Holy Roman Empire, for the Almighty. Unlike the lust for combat and glory that his companions, and even he, himself, professed aloud, Michael feared death. He desperately wanted a full, joy-filled lusty life. At times, when the idea of his own demise crossed his mind, he felt a great cold as though Death had already laid his icy hand on him. Candles lit the chapel but dimly. All the sounds were soft ones, monks chanting, the murmur of men praying, the occasional bark of a cough, the slow drip of melting frost, the heavy breathing of the exhausted, the clink of armor as men shifted position, occasional snoring. After a while Michael's own eyelids became heavy and his thoughts dull. Earlier that day he and other vassals of Margrave Heinrich had rode hard across the snow-blanketed Saxony plains. A bitter wind had swept in from the north, whipping the fallen snow into blinding white sheets. Nonetheless, the men were lighthearted, joking, bragging, horse playing and did not speak of the coming battle except in a jocular vein. Even Michael. It was after he heard the archbishop's sermon and had a chance to reflect that soon he could be in heaven or hell that dread began to eat at him. Even these fears faded as exhaustion overcame him. With his head resting on his bent knee, he dreamt that he was on an orange-hued plain of vast dimensions surrounded by fire. A lion leaped from the flames, bounded toward him, halted and roared loudly, but did not attack. Next, a Cherubim appeared in the sky and flew down to land at his feet. This most curious creature had large wings, a human head and a lion's face. It said, "What thou dread shall come within a hairsbreadth, but ye shall be spared. A kin wilt be taken in thee place." Far off a bell tolled. He opened his eyes. He had been awakened by Matins. It was the hour before morningtide. Soft light crept in from the chapel's high narrow windows, giving a hazy glow to his surroundings. The chanting of monks made his crossing from the world of phantoms mystical and portentous. When he reflected on his dream, he interpreted it as meaning that his place in heaven was assured. He found out differently later. The dream was a prophesy. He and the other knights were quartered in the castle for the remainder of the storm-filled winter. While Michael abided there, he was kept busy polishing armor, practicing swordmanship and faithfully performing other tasks assigned to him. All during that time, his strange dream, the archbishop's words and what lay in store for him beyond the grave weighed on his mind. Spring followed winter only too swiftly. Late in May, Gog and Magog were ready to do battle. The last battle, as Michael thought of it as he nervously awaited the dawn on a small rise at one end of a grass-covered, hilly plain surrounded by dense forest. At the other end of the meadow, in the dark of the early morning hours, the Norman campfires and torches were flickering sparks. The earth between was uneven with several small hillocks. The sun rose bright and a warm, and a gentle breeze wafted over the plain. Some brush, saplings and berry bushes grew in a sea of tall grass, nettles and poppies that rippled in waves. Clouds in the shape of dragons and giants drifted across an otherwise clear blue expanse. Ravens and robins fluttered about, landing at times to peck at unseen objects in the grass. Hardly a whisper of sound disturbed the pastoral scene, only the sighing breeze, cawing of the ravens, nickering of horses and metallic clink of armor as men mounted their steeds. While Michael gazed out at this peaceful panorama, this second Eden, steeling himself for battle, his heart thumped wildly against his breast. Because it was his first battle, he did not know what to expect. He raised his eyes to the enemy camp. So far away, the foe seemed diminutive. Sunlight sparkled on their armor like the light of glowworms on a summer eve. It seemed strange that in a few moments, he would ride toward them with murderous intent. And what was terrifying to the extreme -- that they would be rushing forward to send him to his own cold grave. The young boys beat the drums in a slow strident tattoo, and the standard bearer raised the margrave's colors. In the manner that Michael had practiced for so long and so hard, he raised his lance in unison with his fellows and dug his heel into his mount's flank. In formation with the others, his steed walked slowly forward as though parading before the margrave. Michael glanced about. Villein foot soldiers, armorless, in dark peasant's garb and carrying pikes and battle axes, stepped lively to keep pace with the mounted knights, their legs pumping up and down in time with the cadence. Michael noted that more than one crossed himself or made a mystical sign to a pagan god as he strode forth. Ahead, the Normans approached in a like manner. As Michael rode into a shallow dell between hillocks, the drummers beat a faster cadence. He urged his mount into a trot. At the top of the rise, the enemy was a scant fifty yards away. Now he could see the Normans clearly. They were tall, more than a head taller than most Saxons, with horned helmets and long blond hair twisted into braids that lay on their chest or back. Such giants could not be real men, but must be demons. At a distance their faces seemed death heads. Cold terror washed over him like the icy flow of the Leine River in March. The Norman front line was a wall of archers. They halted, drew and shot. Arrows sprayed among Michael's troop like wind driven hail. Piercing screams rent the air. On every side, Michael's companions fell to spatter their blood on the earth. With a swift kick he broke his stallion into a gallop. The next moment he was in the thick of battle surrounded by an eerie high-pitched roar such as one would hear in the fiery regions of hell; battle cries of conflicting armies, screams of the wounded and dying, nickering of fright-maddened horses and the clanking of metal against metal. Moments became hours. His senses were heightened to such an intensity that the cries and grunts of men in battle blasted into his ears like trumpets, and the horseflesh beneath him chafed him raw. Before Michael could ram his pike into his first enemy, his steed reared, struck by Norman steel. The world wheeled and the ground struck him in the back painfully with an audible thump, collapsing his lungs so that for several precious moments he could not breath. As he struggled to his feet, off-balance and unprepared, a silver-haired Norman giant bore down on him screaming his terrible war cry and whirling an enormous battle-ax above his head. Michael was helpless as a crippled child. He could do nothing but look into the awful face of death in the form of a blond demon. But, as the Norman leaned over to separate Michael's head from his shoulders, Michael's older brother Claus, who had been on Michael's right hand and slightly to his rear, speared the Norman giant through the heart and rode on. Michael's terror at his narrow escape from death paralyzed him for long moments. Then complete panic took over. He dropped his sword and shield and ran, not stopping until he was well into the woods. Stumbling and gasping, he sank to the forest floor and wept. A rush of thoughts and memories went through his mind with blinding speed. He was a devout Christian, loyal to Margrave Heinrich his master and Emperor Otto, but fear of death had put doubts in his mind. What if the religion he had been taught was nonsense? What if death was the end, and all he would become was a rotted corpse? To face such a fate out of loyalty to leaders, who after all were men like himself, seemed madness. On the other hand, he knew that he was disgraced, a craven coward who had run from battle. When he returned, he would be punished, hanged or worse. How ironic, to escape death in battle only to be strung up on a gallows like a common criminal. If he returned to the fray quickly, that ignoble fate would be spared him. But he could not. He shuddered as he recalled what had almost befallen him. Terror shook his body in spasms. It paralyzed him, drove every other thought and emotion from his mind. The heaven that he had believed in so faithfully all his life suddenly seemed a Chimera; only darkness and nothingness, forever and forever, was to be his fate. Or worse, he would fall into the abyss to burn in hell for an eternity. He became obsessed by a single conscious emotion, the horror of his personal death. Thus, he cowered in the woods until nightfall, finally falling asleep under an elm. When he awoke, it was midmorning. Beyond the woods in the direction of yesterday's battlefield, the sounds of battle had been replaced by a great cawing of ravens. Slowly he crept with aching muscles from the damp ground to the edge of the forest to peer out at a horrific scene. What, before the fighting had begun, had been waving grass and wildflowers was now churned up earth stained with blood and heaps of bodies. And ravens, many many ravens, flocks and flocks of them. Their loud caws pierced his heart with dread as they summoned more of their fellows to the great feast of the fallen. Riderless horses roamed about the meadow searching for the ghosts of the men who had ridden them into battle. Michael walked out into this plain of death. The stench was unbelievable, the air thick with the sickly scent of rotting meat. He wound a kerchief about his face to dull the odor and returned to the spot where he almost died, threading a winding path among the corpses. He could not tell by the numbers who had won, only that the slaughter had been terrible on both sides, as Norman and Saxon lay side by side, sometimes caressing their former enemy in death with an out flung arm of forgiveness for taking their God-given life. Most horrible were the dismembered body parts. Michael stepped on an unattached hand and stumbled as he quickly withdrew his foot. In a momentary fit of pique, he kicked it away. He found his sword and shield where he had dropped them. He picked up the weapon and returned it to his scabbard. The shield he let lay. 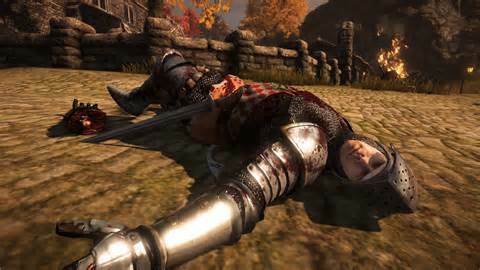 He gazed for a moment at the corpse of the Norman who had almost killed him. In death, the man no longer appeared fearsome, and Michael almost felt sorry for him. For a long time he wandered about gazing at the dead. Some had faces that he knew. Boys and men who had been his companions for years. Never again would they drink toasts and brag about sexual conquests with him. Now they were only meals for ravens and worms. Finally he came upon a decapitated human head. Hardened now, he was about to shove it out of the way with his toe, but something familiar about it made him stop. Instead he turned it over with the tip of his sword. When he saw its face, he let out a loud moan and wept. It was his brother Claus. Claus had suffered the fate from which he had saved Michael. Michael knew that he dared not stay in the field any longer. Soon villeins would return to bury the dead. As a coward who had run from the battle, he was an outlaw. He captured one of the horses, choosing carefully one with a good strong saddle and bridal. He would be doing a lot of riding. With no destination in mind, except away from where the margrave and his men could find him, he rode into the wilderness. If you're enjoying this serial, you may want to read my novels and short story anthologies.